CEFA is grateful and honoured that the new Chief Justice, in her swearing-in speech, chose to mention our arrangement to establish the Australian Constitution Centre in the High Court of Australia. CEFA and the High Court will educate Australians and promote public understanding and appreciation of the Australian Constitution. Together we will explore the Constitution’s story and history, along with its processes and contemporary relevance. For this week’s CCF we give you the full text of Chief Justice Kiefel’s inspiring speech. Your Excellency, Mr Attorney for the Commonwealth, your Honours, members of the legal profession, ladies and gentlemen. Thank you for your attendance today. Mr Attorney, Ms McLeod, Mr O'Sullivan and Mr Hughes. I am heartened by your kind words, as I have been by the many expressions of goodwill and support that I have received. I am mindful, however, that it is possible that compliments could in the future be replaced by criticism, from other quarters. I shall therefore bask in them, but only briefly. The Court is honoured by the presence of their Excellencies the Governor-General and Lady Cosgrove, of former Chief Justices the Honourable Sir Gerard Brennan and the Honourable Robert French and of the Right Honourable Dame Sian Elias, Chief Justice of New Zealand. I am delighted that my former colleagues the Honourable William Gummow, the Honourable Michael Kirby, the Honourable Kenneth Hayne and the Honourable Susan Crennan are sitting with us today. I am pleased to have been sworn in as Chief Justice by my dear colleague, Justice Virginia Bell. This occasion is therefore historically significant on two counts. The Court welcomes you, Mr Attorney, the Shadow Attorney-General, the President of the Senate, the Speaker of the House of Representatives, the Chief Justice of the Federal Court, the Chief Justices of State and Territory Supreme Courts and judges of those courts, the Acting Chief Justice of the Family Court and judges of other courts, retired judges, the Solicitors-General of the Commonwealth and of the States and Territories, and the Presidents and members of Bar Associations and Law Societies and of the Law Council of Australia. I am personally honoured by the attendance today of members of my family, especially my husband and my sister, and our friends. Some have travelled a considerable distance to be here and I am deeply appreciative that they have done so. There have been six Chief Justices of this Court since the time that I commenced my legal studies. I have had something of a personal connection with three of them. Sir Gerard Brennan was still in practice as a Silk at the Brisbane Bar when I began my legal studies. He was kind enough to seek me out in order to loan me his treasured texts on Roman law and thereafter would enquire as to my progress. 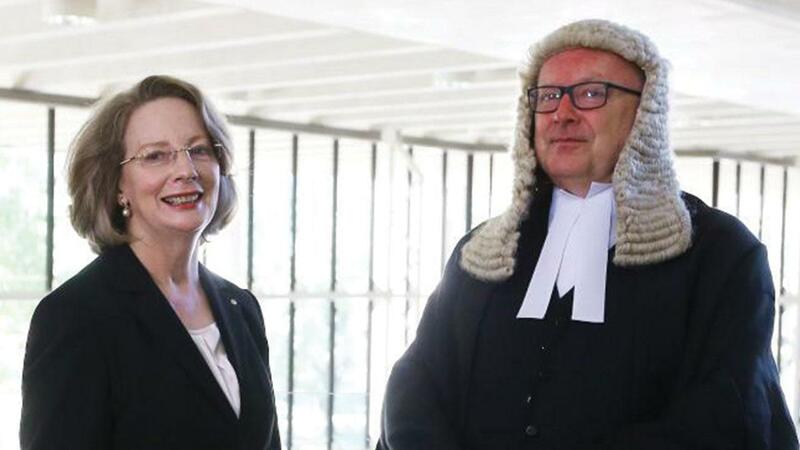 It was of some pleasure to me that, many years later, Sir Gerard was a member of the Court when it sat, ceremonially, on the occasion when I announced my appointment as a Senior Counsel for Queensland. A similar ceremony will take place in this Court tomorrow. I came to know Sir Harry Gibbs through a solicitor, Gerald Patterson, who was a close friend of Sir Harry's and one of my staunchest supporters when I first came to the Bar. Whenever our paths crossed, Sir Harry was kind enough to express an interest in how I was getting on at the Bar. His greatest act of kindness, though, was during one of my first appearances in this Court. He reminded me of the next step in my argument when a question from Sir Garfield Barwick resulted in me suffering a temporary loss of memory. I have enjoyed a friendship with the retiring Chief Justice, the Honourable Robert French, since shortly after I joined the Federal Court in 1994. I believe that we may both have learned much from our time on that Court about the importance of civility and collegiality. At a ceremony in this Court, in December last, fitting tributes were paid to the considerable public service that he has given as a judge and the contribution that he has made to the law. It has been my privilege to serve with Chief Justice Gleeson and Chief Justice French since I joined this Court and a pleasure to work with my colleagues. At the opening of the High Court in 1903 the first Chief Justice, Sir Samuel Griffith, said that "[w]e know that we shall be expected to solve difficult questions, to compose strife between states, and possibly between the states and the Commonwealth". Sir Samuel was right on each count. There have also been important historical events affecting the Court, such as when the right to appeal to the Privy Council was finally abolished. It was important because it enabled the High Court to assume its present position as the final arbiter of appeals in Australia and more confidently to develop the common law of Australia. In the year preceding the opening of this Court, Australian women were given the right to vote at federal elections. It was then that they truly became part of "the people" to whom our Constitution refers. That year also saw the first woman graduate in law from an Australian university. It would not be until 1987 that a woman, the Honourable Mary Gaudron, was appointed to this Court. When I came to the Bar in 1975 there were very few women members of the profession. This is not the occasion to consider why this was so. The point presently to be made is that this has changed and so has the composition of this Court. In more recent times the appointment of more women to this Court recognises that there are now women who have the necessary legal ability and experience, as well as the personal qualities, to be a Justice of this Court. There seems no reason to think that that situation will not be maintained in the future. It may well improve. Sir Samuel Griffith also spoke of the "weighty and responsible duties" the new Justices had undertaken. Chief Justices, like the other Justices, give a part of their lives to the service of this Court and thereby to the people of Australia. That service is not given for the purpose of personal acknowledgment or the enhancement of reputation. It is given to ensure that this Court is maintained as an institution in which the government, the legislature, the legal profession and the people of Australia can have confidence. The presence of so many Chief Justices here today, from Australia and New Zealand, is a reminder of the co-operation which is effected through that national and trans-Tasman body, the Council of Chief Justices of Australia and New Zealand. The presence of so many judges from different courts reminds us that, whilst the High Court stands at the apex of Australian courts, its position depends upon the existence of all Australian courts. Its work relies upon the diligence and dedication of judges of courts at every level. This Court will strive to assist these courts by providing decisions which are clear and which offer practical guidance. It is sometimes said that Justices of this Court must write judgments with an eye to the past and also to the future. We could also look around us, as did judges of the English tradition in the past. Communication and translation technology allows us an even wider perspective. We can observe how other courts reason in areas of common interest. Identifying and comparing our different approaches can provide us with a deeper understanding of our own laws. In the not too distant past the term "globalisation" may have been thought to be little more than a slogan, but it may now be considered to be a way of thinking about the world rather than ourselves in isolation. This Court maintains dialogues with overseas courts, including courts in the Asia Pacific region. Some are undertaken to share knowledge and find solutions to common problems. Others are engaged in to foster a mutual understanding of the work of our respective courts, the constitutional framework within which our courts operate and the laws which we apply. It is no less important that the people of Australia understand our court system. It is to be hoped that the 37,000 school children, from over 750 schools around Australia, who visit the Court each year will be encouraged to learn more about this Court. The High Court is conscious of its educative role. It provides materials about the Court and the Constitution to schools, it makes written arguments in matters coming before the Court accessible and it provides audio-visual recordings of its hearings on its website. It has recently made arrangements with the Constitution Education Fund Australia for the establishment of an Australian Constitution Centre at the Court, by which it is proposed to promote public understanding and an appreciation of the Australian Constitution, its history and contemporary relevance. Since its inception this Court has provided the stability and certainty for which the framers of the Constitution hoped. In accordance with the Constitution, this Court must sometimes declare that legislative or executive power has been exceeded. The Court does so respectfully, conscious of its constitutional role and the role which the Constitution gives to the legislature and the government. The Chief Justices who have preceded me have been persons of the highest integrity and ability. I have been given a great responsibility. With the co-operation of my colleagues I trust that I shall discharge it well and justify the confidence that has been reposed in me. On behalf of the Court I thank you all for your presence today.